PureMarketBroker is a forex broker. Pure Market Broker offers the MT4 and MT4 Mobile forex trading top platform. PureMarketBroker.com offers over 35 forex currency pairs, index cfds, energy, gold and silver for your personal investment and trading options. Pure market broker is a top broker, very reliable and fast . Money back very fast and very profitable PAMM. A good broker to go with. Very reliable and safe. Spread, money back and support are perfect. I have been trading with them very easy with Mt4. Pure Market is a perfect broker. Pure Market is a perfect broker. Trading orders very fast, money back in a day, Etana custody, Pamm manager, spread from zero. Help desk very professional. What else? A good and reliable broker. 5 stars for me. A perfect forex broker for me, very fast and with a professional support, Money back and trading operations very very fast. No requote. I invest 5000 in a Pamm with a big return. My tip: forex broker 5stars. 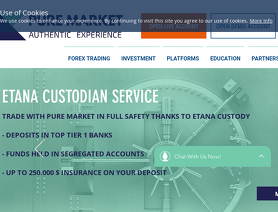 I chose Pure Market Broker because I was looking for a broker that is "no Esma" (without restrictions for european traders); I discovered a fast and reliable broker. The help desk helps a lot; I've never had big problems. I tested the return of money: very fast. I have also invested in a PAMM which is giving excellent results. Forex Broker reliable; 5 stars for Pure Market Broker.